Republican lawmaker Eric Cantor said President Obama must break impasse over taxes for debt ceiling talks to continue. NEW YORK (CNNMoney) -- The bipartisan debt ceiling negotiations led by Vice President Joe Biden went on life support Thursday after a key Republican lawmaker pulled out of the talks. House Majority Leader Eric Cantor said in a statement the group had made progress in identifying "trillions" in spending cuts, but that Democrats "continue to insist that any deal must include tax increases." Taxes have been a central roadblock from the beginning: Democrats say they are a necessary part of any debt-reduction plan, and Republicans say they will not pass a plan that increases taxes. 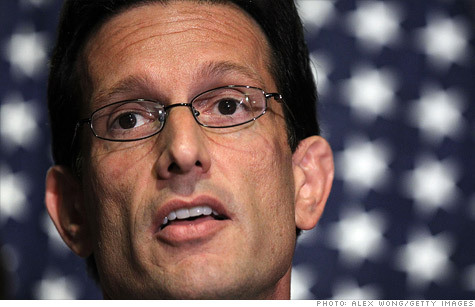 On Thursday, Cantor -- one of two Republicans of the group -- said any proposal to raise taxes won't fly in the House. The tax impasse must be resolved before negotiations can continue, he added. The only person Cantor believes who can resolve it is President Obama. "I believe it is time for the president to speak clearly and resolve the tax issue." House Speaker John Boehner echoed Cantor's message during a news conference broadcast on CNBC. "These conversations could continue if they take tax hikes out of the conversation." An aide to Sen. Jon Kyl, the other Republican in the Biden group, told CNN that he also feels that the talks have gone as far as they can go with the players involved and the president now needs to personally get involved. In the wake of Cantor's decision, a meeting scheduled for Thursday afternoon was cancelled. Biden, in a statement, said the talks are "in abeyance" and that the group will "meet again as necessary." "[T]he goal of these talks was to report our findings back to our respective leaders," he said. "The next phase is in the hands of those leaders, who need to determine the scope of an agreement that can tackle the problem and attract bipartisan support. Obama and White House officials have stressed repeatedly that they believe debt reduction needs to occur "in a balanced way." The administration wants a mix of spending cuts and revenue increases, as well as continued investments in areas of the economy that can help with future growth -- such as education and infrastructure. Republicans have held firm that the country has a spending problem, not a revenue problem, and that cuts sooner rather than later will help bolster economic growth in the long run. Independent deficit hawks and budget experts, meanwhile, offer a more nuanced picture. The Congressional Budget Office on Wednesday issued a report that said lawmakers risk derailing the economic recovery if they act too soon to slash spending or raise taxes substantially. But they risk damaging the economy for decades if they wait too long to tackle the country's burgeoning debt after recovery. And many deficit hawks from the left and right have said revenue increases will need to be part of the long-term debt-reduction mix, because spending cuts alone would be too draconian. If lawmakers wanted to permanently freeze the debt held by the public at the level where it was earlier this year -- 62% of GDP -- they would need to immediately cut spending by 35%, or about $1.2 trillion, according to the Government Accountability Office. And those cuts would need to be permanent. How hard would that be? Consider that in 2010, all of discretionary spending -- including defense -- totaled $1.35 trillion. Earlier this week, longtime political observer Norm Ornstein, a resident fellow at the American Enterprise Institute, told CNNMoney that it will be hard to take statements from debt ceiling negotiators at face value since talks have entered the end-game negotiation stage. The Biden group had set a July 1 deadline to propose a debt-reduction framework that could pass both the House and Senate in exchange for an increase to the debt ceiling by Aug. 2. The Treasury Department has said Aug. 2 is when it will no longer be able to pay the country's bills on time and in full without being able to borrow new money from the bond markets, putting the country at risk of default. -- CNN's Deirdre Walsh and Dana Bash contributed to this report. Is the U.S. like Greece?